This week Associate Editor Miyoko Ohtake made it through the rain that's drenching the West Coast and to Las Vegas for the 2010 International Builders' Show. Hosted by the National Association of Home Builders, the four-day tradeshow featured the latest products, designs, and technologies from hundreds of companies from around the country and world.Trends included high-tech kitchens (with touchscreen systems that offer cooking tips, measurement conversions, and more), a widening array of colors (among them, eight new metallic Corian colors from DuPont) and, of course, ever-more-efficient products and systems. 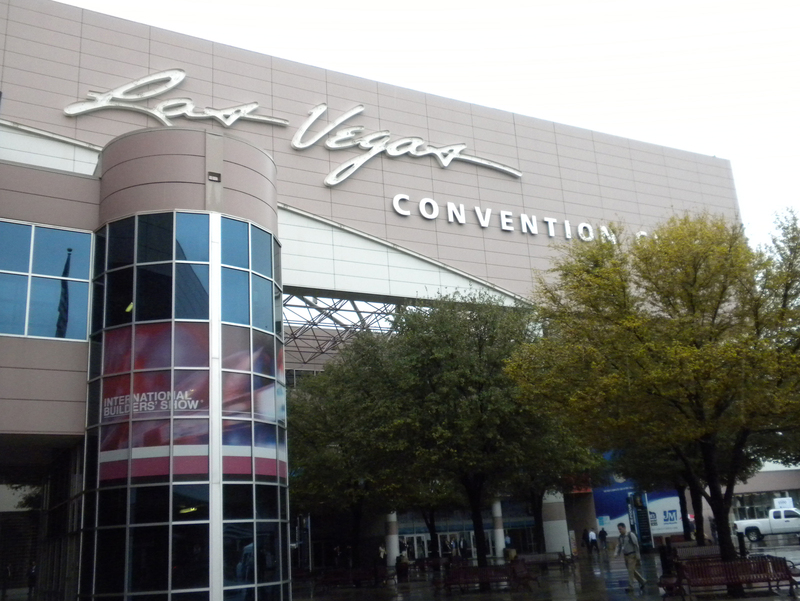 The 2010 International Builders' Show kicked off on January 19 at the Las Vegas Convention Center. Smart kitchen appliances was a trend seen throughout the floors and another KitchenAid product that jumped out was a new refrigerator model (still in the works--see the big "prototype" label on its door). The electronic display above the water spout offers helpful tips (such as measurement conversions) for the cook in need. Nearby were wall ovens with touchscreen displays that help the novice in the kitchen prepare the perfect roast by setting the temperature and time after the user selects the type of meat being cooked, preferred doneness, and type of roasting pan being used. The system includes cooking instructions for handfuls upon handfuls of oven dishes. Though the show was smaller than it was in 2009, it still drew tens of thousands of visitors and hundreds of companies, many debuting new products. Delta Faucets was showing off its popular Pilar faucet, more commonly known as "the touch sink." It was fun to try it out in person: The water turns on and off by simply touching the faucet, though it's smart enough to stay on (or off) when you go to rotate it side to side. In the mammoth Kohler area, visitors were treated to cooking demonstrations and tasty treats. Kohler will bring its latest designs--as well as debut several new products--to Dwell on Design 2010 in Los Angeles, June 25-27. Among some of Kohler's latest designs was its Persuade Ensemble, which includes several vanities designed specifically to fit in small spaces. Kohler was also showcasing its bathroom grab bars. Though grab bars are often an eyesore, the Belay series of handrails was designed to be integrated into the bathroom and the handrail is hidden behind the tiling. Water is able to drip into the space behind the handrail and then drain out of a small slit opening at the bottom. In this picture, the Belay hand rail is shown built into the tiling at the bottom of the display. Uponor had a great booth that highlighted and explained the many home technologies and products it produces, including radiant flooring, energy-saving hot water systems, overhead sprinklers, and electronic home monitoring and control systems (shown here). The touchscreen interface lets the homeowner access information about and control of temperatures in each room, along with controls for water heaters and other systems, and can be controlled wirelessly from a computer or smartphone. Lutron brought its traveling showroom to the convention center. Inside, the first half featured a display of the company's dimmers, including their latest LED dimmer, the Vierti, while the second half was a re-creation of a house (with a miniature bedroom, kitchen, and living room) that was used to demonstrate Lutron's array of products, which include motorized window shades and wireless control tools. Lutron will also be in Los Angeles June 25-27 for Dwell on Design 2010. We've seen many chalkboard walls in kitchens, and this Amana fridge shares the same principle. The front is not only magnetic but is also a dry erase board, perfect for leaving a note or to-do list. View our slideshow to see a selection of products and booths.